The Boston Marathon was held on Monday and it was the usual resounding success. This year was slightly different – it was the fiftieth anniversary of the day that Kathy Switzer appeared in the race. The details of her subterfugeto get entered in a men only race are well known and the assumption of most of the journalists who wrote about it was that it was the first time that a woman had run the distance. Not true – for instance Scotland’s Dale Greig had run the Isle of Wight marathon in 1964, albeit unofficially without a race number and set a world record. In New Zealand that record was broken three months later by Mildred Samson. Even in America women had run the distance and, whisper it, the Boston had been run by a woman. 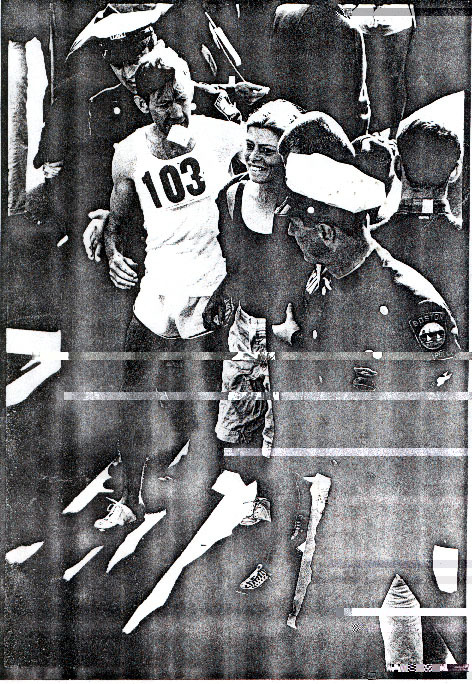 Bobbi Gibb ran in 1966 and was greeted at the finsih by the Governor of Massachusettes. She also ran in 1967 and finished an hour ahead of Switzer. The best short account of her career is on the Wikipedia website and most of what follows come from that source. Roberta Louise “Bobbi” Gibb (born November 2, 1942 in Cambridge, Massachusettes) is the first woman to have run the entire Boston Marathon (1966) She is recognized by the Boston Athletic Association as the pre-sanctioned era women’s winner in 1966, 1967 and 1968 At the Boston Marathon, the pre-sanctioned era comprised the years from 1966 through 1971, when women, who were banned from entering because of their gender, ran and finished the race unofficially. In 1996 the B.A.A. retroactively recognized as champions the unofficial women’s leaders of 1966–71. Gibb’s run in 1966 challenged prevalent prejudices and misconceptions about women’s athletic capabilities. 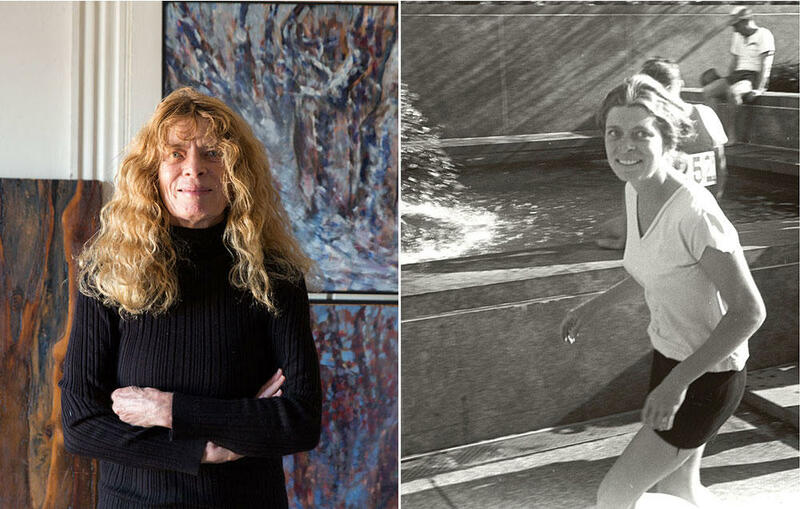 In 1967, the second year of the later-to-be-recognized women’s division at Boston, she finished nearly an hour ahead of the other female competitor, Kathrine Switzer. . In 1968 Gibb finished first in a field of five women. It was not until late 1971, pursuant to a petition to the Amateur Athletic Union by Nina Kuscik, that the AAU changed its rules and began to sanction women’s division marathons. Before 1966, the longest AAU-sanctioned race for women was one and a half miles. Until 1972, when the first women’s division marathon opened, the Boston Marathon was a men’s division race, so all the pioneer women who ran before 1972 were, under the AAU rules, unsanctioned runners, running in an as yet to be sanctioned women’s division race. Gibb trained for two years to run the Boston Marathon, covering as much as 40 miles in one day. 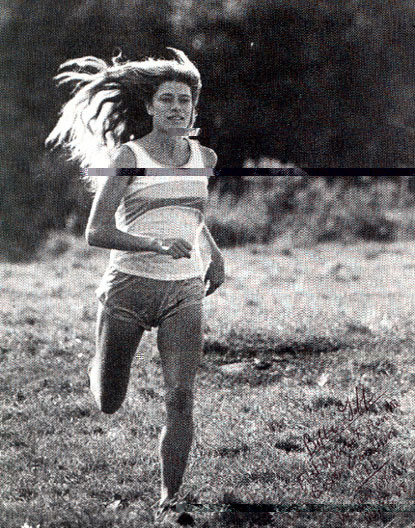 On writing for an application in February 1966, she received a letter from the race director, Will Cloney, informing her that women were not physiologically capable of running marathon distances and that under the rules that governed amateur sports set out by the AAU, women were not allowed to run more than a mile and a half competitively. She realized that it was more important than ever to run and that her run would have a social significance far beyond just her own personal challenge. After three nights and four days on a bus from San Diego, Gibb arrived the day before the race at her parents’ house in Winchester, Massachusettes On the morning of Patriots Day, April 19, 1966, her mother dropped her off at the start in Hopkinton. Wearing her brother’s Bermuda shorts and a blue hooded sweatshirtt over a black, tanked-top swim suit, she hid in the bushes near the starting pen. After the starting gun fired, she waited until about half the pack had started and then jumped into the race. Roberta the runner may revolutionize Boston’s fabled BAA marathon — and for that matter every other long distance run staged in the country. Even as the bunions acquired from Tuesday’s grueling 26 mile, 385 yard race were subsiding, the furor over a woman’s intrusion into what had been an all-male domain was mounting. But a spokesman from the New England Amateur Athletic Union has already decided it may be a woman’s world after all. He plans personally to contact the organization’s national headquarters and seek consideration for suspension of the NAAU rules so that a female who wishes to compete in the marathon can do so. In his opinion the only way the rule could be circumvented would be through suspension of the rules. Last week a tidy-looking and pretty 23-year-old blonde named Roberta Gibb Bingay not only started but also covered the 26-mile, 385-yard course at a clip fast enough to finish ahead of no fewer than 290 of the event’s 415 starters. In 1967, Gibb, by then a full-time student at the University of San Diego, California, ran again. She finished in three hours, twenty-seven minutes and seventeen seconds, almost an hour ahead of the other female competitor, Kathrine Switzer who was famously subjected to a failed attempt by an official to remove her from the race, because she ran with numbers issued through an “oversight”. Gibb, who ran unnumbered, was not similarly bothered. In 1968, Gibb ran again, finishing in three hours and thirty minutes, first among a growing number of women, which included Carol Ann Pancko, Elaine Pederson, and Marjorie Fish. In 1969, 1970, and 1971, Sara Mae Berman was the women’s winner, and in 1972, Nina Kuscik was the winner of the first officially-sanctioned women’s division event. In 1996, at the 100th running of the Boston Marathon and the 30th anniversary of Gibb’s first run of it, the BAA officially recognized her three wins in 1966, 1967, and 1968 and awarded her a medal. Her name was inscribed with the names of the other winners on the Boston Marathon Memorial in Copley Square. In 2016, Gibb was the grand marshal of that year’s Boston Marathon.. That year’s female winner, Atsede Baysa, gave Gibb her trophy; Gibb said that she would go to Baysa’s native Ethiopia in 2017 and return it to her. The address of this site is https://www.firstgiving.com/5280_1/bobbi-gibb-fundraiser The signatures at the foot of the page are The Bobbi Gibb Marathon Sculpture Project plans to raise funds from corporate sources, but primarily from modest donations by women’s running supporters worldwide. The following Boston Marathon champions have all volunteered to serve on the Advisory Committee. Bobbi was the first woman to run Boston, first in three consecutive years, the first to run the race fifty years after she first won it and yet is barely known outside the USA running fraternity. So tell your friends and club mates that she is the real Boston heroine.